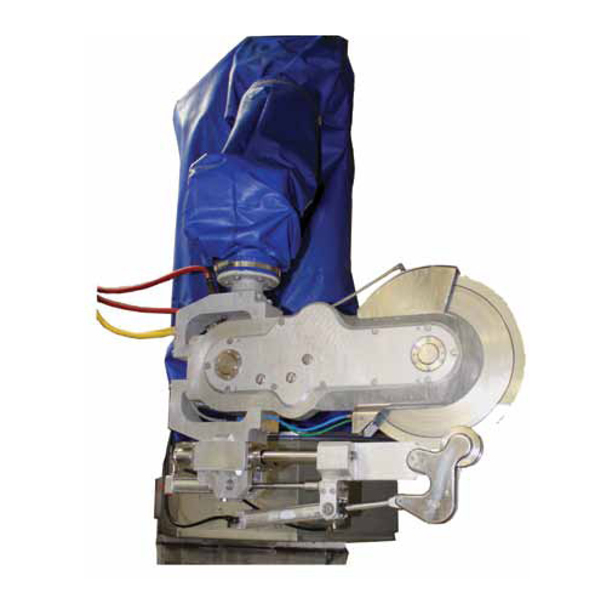 The Jarvis Model JR-165 – Robotic Hog Splitter for continuous hog splitting operations on the kill floor. • Latest technology in robotic hog splitting, capable of 600 head per hour. • High production rates and faster line operations. • Uniform feather bone division. • Higher amounts of speciality products. • Stainless steel base and a completely jacketed arm makes the JR-165 easy to clean and maintain. • Adapts to any type of slaughter line. • Longer saw blade life cycle. • Installed anywhere on any production line, including close to corners. • Automatic size adjustments for various sized carcasses – based on both weight or length.